A pretty common question that new parakeet owners have is whether it’s safe to continue using nonstick or Teflon pans. The bottom line is that nonstick cookware and parakeets don’t mix. Nonstick cookware is coated with a synthetic polymer called PTFE, Teflon is PTFE, it’s the trademarked name that DuPont uses for the polymer. The message that marketers want you to hear that is Teflon and other PTFE coatings are only dangerous at high heats, some studies say that the dangerous fumes are only released at upwards of 500 degrees. This is not the case, here’s an infographic about common cooking temperatures and what chemicals are released and it seems pretty clear that you can risk bird death at typical cooking temperatures. Now, even if you don’t have birds and don’t ever intend to have them I would still encourage you to get rid of your nonstick cookware, mostly because I’ve come to believe that anything that will kill a bird suddenly will probably harm me over time (canary in a coal mine, anyone?) and also because human beings have been known to come down with flu like symptoms after Teflon use, it’s actually called “Teflon flu”. I’ve seen several people on social media encouraging new bird owners to continue using nonstick and saying “just don’t ever burn anything”, and they’ve done the same for 800 years and never had an issue. Well, I have a couple of questions for them, one is that may be fine for you, but why would you encourage a new bird owner if there’s even the slightest risk? How will you feel when they come back in a week or two lamenting the loss of their bird? Also, who has ever set out to burn something? Perhaps in your household no one ever distracts you while you’re cooking, but I don’t see how there’s even the slightest way you can guarantee nothing will ever burn in your kitchen. It seems like I burn something every time I make dinner and I can assure you I didn’t plan for that to happen! Really though, PLEASE give up the Teflon, birds with Teflon toxicosis experience scorched lungs and ruptured blood vessels and it sounds like an absolutely horrible and terrifying way to die. When you are buying your new cookware be sure to avoid Teflon, PTFE, PFOA and nonstick that doesn’t specifically reference being free of those polymers. I think sometimes manufacturers put the word nonstick on products hoping that if consumers don’t see “Teflon” they will think a product is safe, but remember Teflon is just the trademark that DuPont uses for the chemical, it is not the only thing that is dangerous. Some safe cookware is stainless steel (Cuisinart MCP-12N Multiclad Pro Stainless Steel 12-Piece Cookware Set ) or cast iron (Outdoor Gourmet 5 Piece Cast Iron Cookware Set ). I can’t use cast iron with my glass stove top, so I made the switch over to stainless. Ceramic is also a good bet, I love my ceramic insert crock pot (Hamilton Beach 33473 Programmable Slow Cooker, 7-Quart, Silver ). My bottom line is that you’ve gotten your pet budgie, you love him, you spent a substantial amount of money on getting him all set up – so why wouldn’t you spend a bit more to safeguard him against a KNOWN and scientifically proven bird killer? Pancakes are one of the few things I miss making at home! Agreed, of course, absolutely worth it for everyone’s health! Thank you for the newsletter and all of the terrific information! I’m hoping the answer to this is positive. So, as soon as I started hearing about the problems with Teflon (way before I brought a little feather-monkey into my life), I got rid of all of it. I really enjoy cooking, and over the years, I’ve built up my kitchenware with a good variety of quality cookware — it realy makes a difference in the whole process (food cooks better bc heat is more evenly distributed, etc.). So, I have a lot of non-stick stuff that “isn;t* Teflon, but the better quality anodized aluminum products branded as Calphalon and Analon. Is this stuff safe for my budgie? Hi Albert! Thanks for your kind words! Regarding the anodized aluminum cookware, it seems that some of it is perfectly safe, but some anodized aluminum pans do ALSO have a non-stick coating that would be dangerous. It depends entirely on the individual products, even under a single manufacturer like Calphalon. If you have the packaging or know the name of the product it would be possible to look it up on an individual basis. Failing that if you’ve had your feather monkey for several years without issue then I would say keep doing what you’re doing, but when it’s time to replace the Calphalon/Analon just make sure the new cookware doesn’t have PTFE/PFOA. Thank you! I looked them up, and the kind I have are both PTFE (Teflon) and PFOA free — yay! Excellent article! 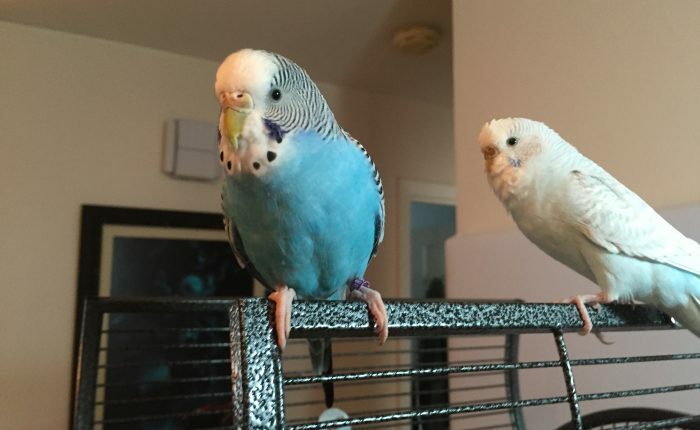 A must read for first time budgie owners.